"The future of the hobby needs more companies like Academy Games!" 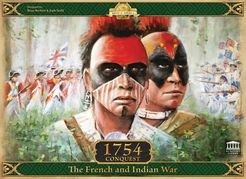 Rick Martin checks out Academy Games' 1754 Conquest – The French Indian War for Armchair General, which he really enjoys and gives a 97% rating. He has one major quibble: "Regrettably, there is no real way to play the game solo at this time." Club Fantasci Review of "1754 - Conquest"
Maurice Fitzgerald pens an excellent review of Academy Games "1754 - Conquest" for the Club Fantasci site.